For those interested in purchasing a safe that offers maximum security and protection of valuables, a B-rated steel safe through Value Safes is an ideal fit. All B-rated safes that we carry at Value Safes meet all necessary standards for theft protection, which include a 1/2 in. thick steel door, a 1/4 in thickness for the body panels of the safe, and drill resistant hard plate around the lock to further discourage tampering with the safe. All security and cash safes we offer come with pre-drilled anchor holes, which enable them to be bolted down into any given foundation. In testing the integrity of the safe with a sledgehammer, we found them to be durable and fully capable of securing items. Following the sledgehammer test the safe showed mere dings because of the entry attempt, and trying to gain access to the valuables present caused fatigue. At Value Safes, we stand by our product 100% and can guarantee you maximum theft protection at a reasonable, affordable cost. Please browse our site to see each of the available options we have for cash and security steel safes, and what each model has to offer. We are looking forward to assisting you with your safeguarding needs. Bolt down hardware included, 2 user electronic lock. B Rated cash safe. Ideal in commercial environment. Heavy duty steel body with large bolts. Also have commercial grade Group 2 dial lock. No fireproofing. But is does bolt to the ground and is ready to withstand a beating from any would be thief! B Rated cash safe with Type 1 high security military grade Spartan lock from S&G. Solid steel construction and bolts to foundation. Excellent for storage of cash but has no fireproofing. B Rated solid steel safe designed to hold cash in commercial environments. Equiped with a S&G Group 2 dial lock. No fireproofing. But is designed for maximum theft protection. Bolts to foundation. B Rated cash safe with High Security Military Grade S&G Type 1 electronic lock. Solid steel for anti-theft. Bolts to foundation. No fireproof. A favorite in commercial usage. 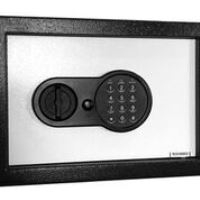 B-Rated Cash solid steel cash safe with inner locking compartment. Removable shelves and bolts down securely to any foundation. Designed for heavy commercial usage. Same safe as the "C" model but has a high security military grade S&G Spartan electronic lock installed. Solid steel and very secure.